Copper roofs are energy efficient and beautiful, but bird droppings can stain and discolor this brilliant metal. In order to remove bird droppings, you must be careful because copper is soft and cannot be scrubbed with metal or many abrasive cleaners. However, there is an easy and natural way to remove bird droppings from a copper roof. Sweep all debris off the roof. You must do this first so that when you are cleaning the roof you do not end up just smearing mud around on the surface. Create a cleaning paste of vinegar, salt and lemon juice. Start out with 2 cups of vinegar, 2 cups of lemon juice and 1 1/2 cups of salt in your shallow plastic tub. You can make more if necessary. Scrub the roof with the salt mixture. The salt will scrub off the bird droppings, but it will not scratch the roof because the salt will melt away rather than scrape your copper. You can clean large areas with the push broom, or small areas with the scrub brush with plastic bristles. The lemon juice and vinegar will shine the entire roof. Rinse down the roof. Use a garden hose to make sure that all the salt, vinegar and lemon juice are gone from the roof. Shine your roof with copper polish. If you have a large roof, you may prefer to allow a protective patina to develop on the roof. 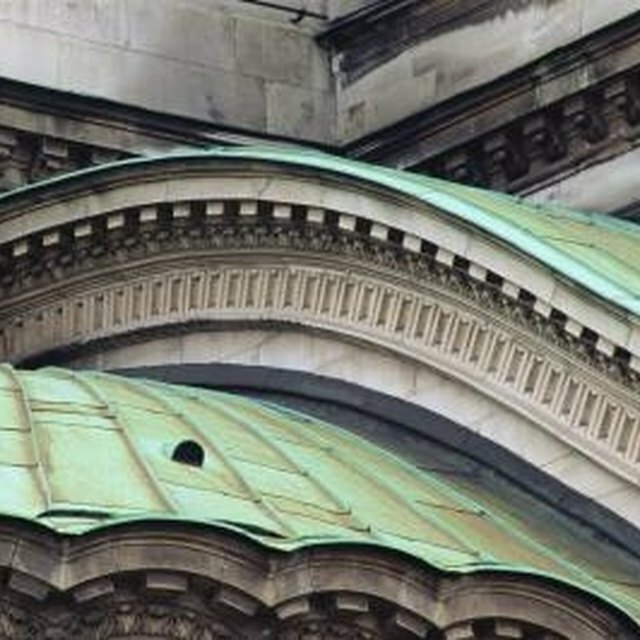 However, many people like small copper roofs and overhangs to remain "penny-bright." If you wish to keep your copper bright, then use copper polish and a plastic-bristle brush to shine up the surface of the roof. Once you are done, you can rinse everything off again and start enjoying your beautiful new roof. Do not work alone if you can avoid it, because a fall could prevent you from getting help.